It was so good, I went twice. That’s not something I can say about many places I review, but I am pleased to report that this restaurant took me completely by surprise. Harissa Mediterranean Kitchen, which opened in Newcastle’s Sandyford district just a few weeks back, is the sister company of the admirable Food Nation, a Newcastle based social enterprise which runs cookery classes and works with schools and businesses to “inspire people about good food”. Food Nation is supported by organisations like Jamie Oliver’s Food Foundation. This means it’s all about food that’s good for you, which, as everyone knows, doesn’t always mean good food. It’s like the difference between “dirty burgers” (so bad they’re good) and “clean eating” (so “good” it’s repellent). 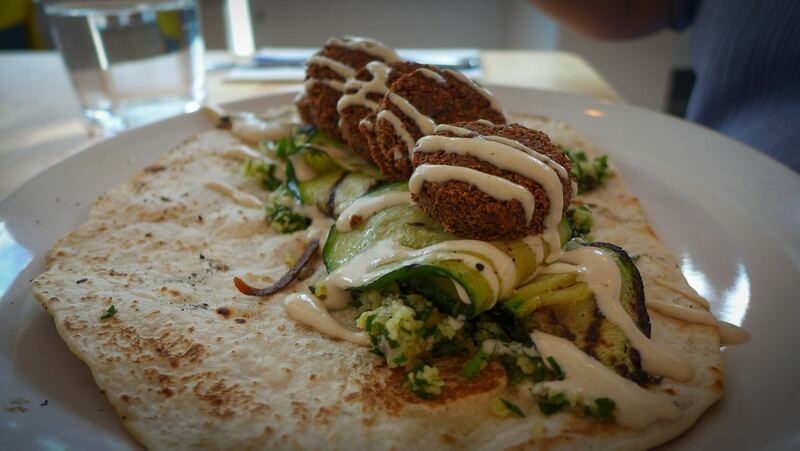 The nice thing about Harissa’s food is that it’s not just healthy, it’s also delicious and unlike anything else in Newcastle. It has the added bonus of being served in a space where it’s a pleasure to spend time. The small but perfectly formed dining room reminded me of a recent meal at Ottolenghi’s gaff in London’s Islington. Here, as there, whitewashed walls serve to accentuate blasts of blue and yellow furnishings. Furniture is plasticky yet comfy and there were simple but attractive flower arrangements on every table. Water was proffered without prompting as soon as we sat down. Note to all restaurants: this, and a smile, is all it takes to make me feel welcome. 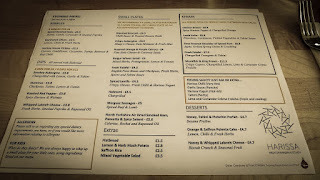 The menu is cut from the same pan-Med cloth that Mr Ottolenghi has spent the last eight or so years popularising in his books and restaurants. 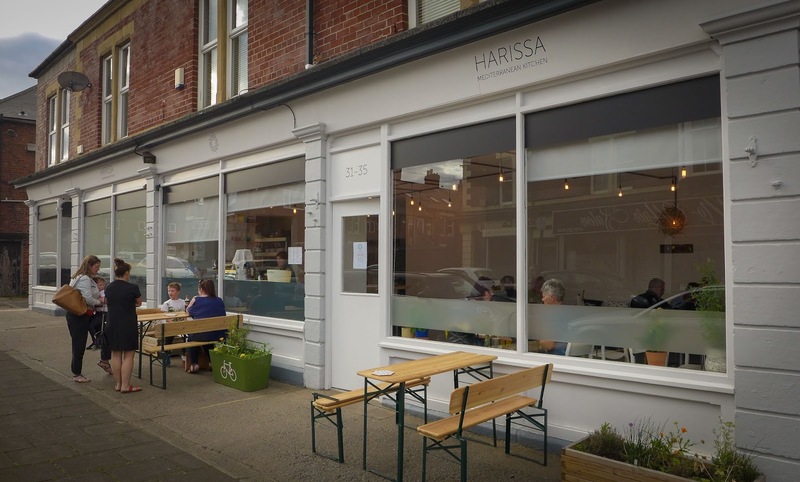 Newcastle has more Lebanese shawarma-slingers than you can shake a stick at, and these are fine as far as they go, but the food at Harissa is less wedded to any particular area of the Mediterranean, and all the more fun for it. Dips (3 for £6), served with warmed pitta, were all on a tasting scale that ran from nice to gorgeous. 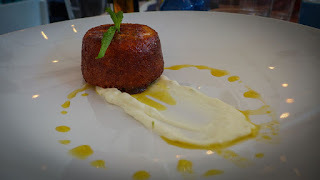 The latter adjective fitted the whipped labneh, a luscious strained yoghurt, which was riotously creamy and perked up no end with smoked paprika. A smoked aubergine and tahini effort would have been improved by not being fridge-cold. 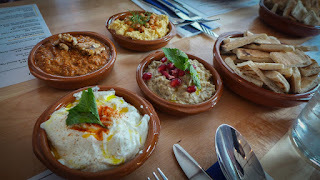 Hummus was given extra class with a crispy chickpea topping, though, to be picky, it could have been a touch smoother and also needed a freer hand with the tahini. However, a plate of mixed pickles involving cauliflower, beetroot and carrot was a total triumph, each vegetable tasting very much of itself but also improved by its gently spiced vinegar bath. 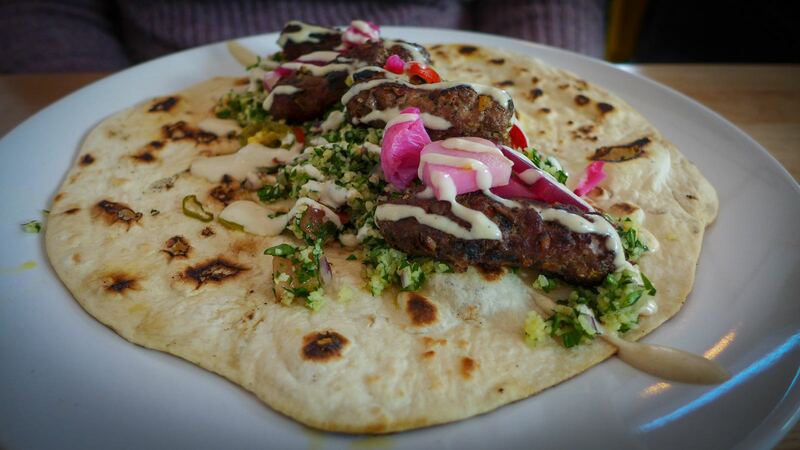 The kebabs we ordered as main courses arrived in a “stuff on a flatbread” format that required some audience participation in order to fold them into an attackable shape. 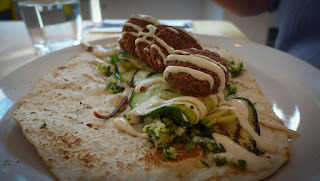 The flatbreads were good (they arrived wholemeal one night and made from white flour the other), while a proper (tons of parsley, not too much bulgar wheat) tabbouleh provided an emerald-hued bed for the main event. On our first visit Mrs Diner chose monkfish and prawns (£11.50), both admirably lightly cooked. My lamb koftas (£8.80) were pink within and charred without, which is a neat trick to pull off. The chicken in another kebab was overcooked, but just about rescued by its harissa-yoghurt sauce. We turned these mains into a feast by supplementing them with a few small plates from a very tempting list. Merguez sausages were as good as any I’ve had outside of Strasbourg, with an almost gamey funk to their gloriously brick-red innards. Perfectly crisp-fried aubergine came in a bhaji-style batter; the sweetness of date molasses and the sharpness of sheep’s cheese were perfect co-conspirators in a compellingly good dish. 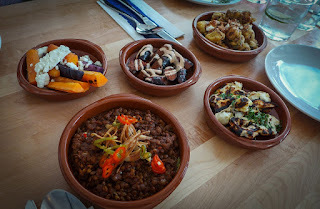 Meanwhile, spiced lentils demonstrated how a humble pulse can be transformed by the thump of cumin and coriander and a ghost-like waft of cardamom; charred halloumi was as good as halloumi can ever be. The servers were all charm and enthusiasm, their smiles as colourful as the platefuls of food that announced themselves with wild wafting fanfares of spice. In truth, there were a couple of minor service issues, but nothing that a bit of experience and bedding in won’t put right. The wine list is short to the point of abruptness, however it had some inspired choices. 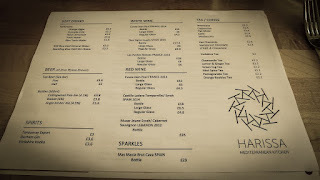 Chateau Musar is a fine, heavy Lebanese red which ages magnificently - seek it out - but also costs. Whoever had the bright idea of stocking its younger, cheaper, but still excellent sibling has my gratitude; its tightrope-balance of soft tannins and light acidity were the perfect foil for the warm spicing of this food. 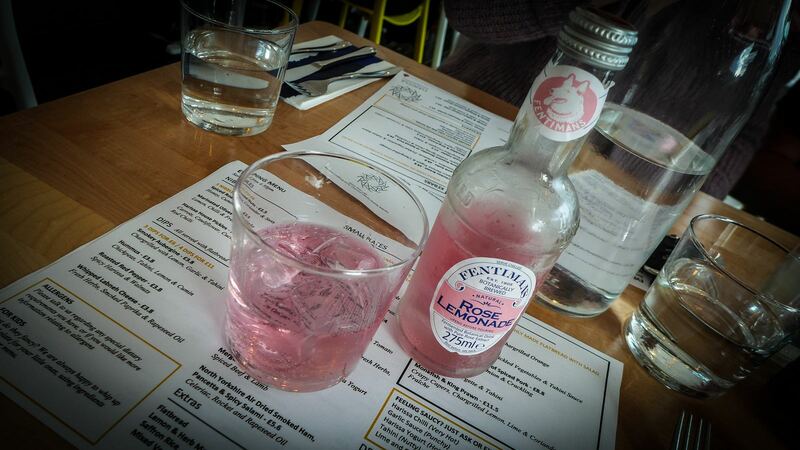 As, too, was a glass of Fentimans Turkish Delight-ish rose lemonade. In my experience, Mediterranean restaurants sometimes get lazy about puddings, but there was no danger of that here. A pistachio and tahini parfait was well made, the use of sesame paste restrained, but echoed by some quite excellent sesame brittle. A sturdy polenta cake was all the better for having been saturated in an orange syrup. Jamie Sadler, whose project this is, should be proud of what he’s achieved so far. He clearly knows what he’s about, from the choice of cooks to the nifty branding. 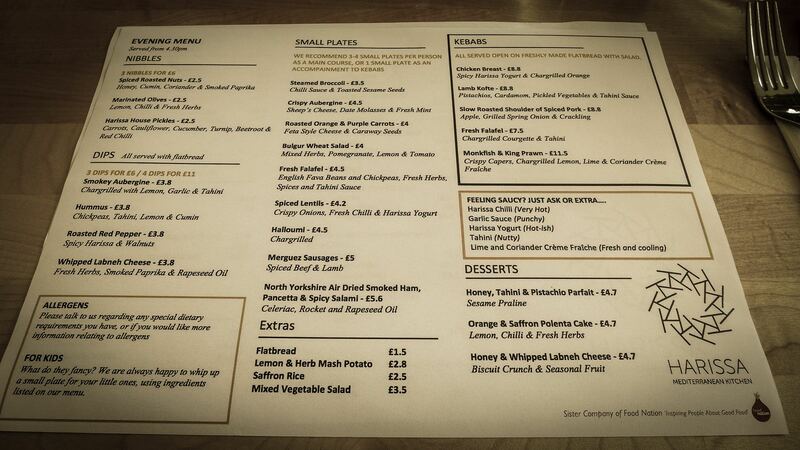 I’m looking forward to seeing how the menu develops over time. I’m also particularly pleased that all staff are paid the living wage and that there is a commitment to using local, sustainable produce, some from their own allotment. There are plans to run a takeaway service from the ample kitchen: in which case, I may have to put in a regular order.